Three Mile Island nuclear plant, seen in March 1979, was the site of the worst U.S. nuclear accident. (CNN) -- Authorities at Pennsylvania's Three Mile Island nuclear plant were investigating what caused a weekend radiation leak that resulted in 150 workers being sent home, officials said Sunday. An airborne radiological contamination alarm sounded about 4 p.m. Saturday in the Unit 1 containment building, according to a statement from Exelon Nuclear, which operates the Three Mile Island plant near Middletown, Pennsylvania. The unit had been shut down since October 26 for refueling, maintenance and steam generator replacement, the company said. "A monitor at the temporary opening cut into the containment building wall to allow the new steam generators to be moved inside showed a slight increase in a reading and then returned to normal," the company said. "Two other monitors displayed normal readings." 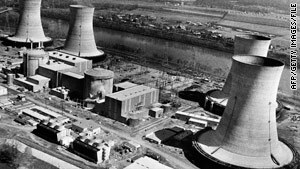 Three Mile Island was the scene of the worst U.S. nuclear accident, a partial meltdown in 1979 that resulted in the plant's second reactor being shut down permanently. Tests showed the contamination in Saturday's incident was confined to the building itself, and none was found outside, Exelon said. There was no threat to public health and safety, but the workers were sent home because they could not continue until the area was cleaned, Bill Noll, Exelon vice president, said in the Saturday statement. One worker was found to have received 16 millirem of exposure, and others received lower levels of contamination. The annual occupational dose limit for workers at Exelon plants is 2,000 millirem, the statement said. Radiation exposure from a chest X-ray is about 6 millirem, according to the Nuclear Regulatory Commission. Although Noll said it was hoped work would resume at Unit 1 on Sunday, Exelon spokeswoman Beth Archer told CNN on Sunday it had not resumed, as the cause of the leak was still under investigation. Two radiation specialists from the NRC were scheduled to investigate Sunday. "Numerous work activities were going on in the building at the time the alarm sounded, and Exelon engineers are working to determine the cause of the incident," the statement said. The March 1979 accident at Three Mile Island brought the nuclear industry to a standstill. The partial meltdown of Unit 2's nuclear core resulted in no injuries to plant workers or nearby community members, but it triggered changes in nuclear power plant operations and emergency planning and led to tighter oversight of the industry by the NRC. The Unit 2 reactor is permanently shut down and defueled, the NRC said. In 2001, FirstEnergy acquired it and contracted its monitoring to Exelon, which owns Unit 1. The companies plan to keep Unit 2 in "long-term, monitored storage" until the Unit 1 operating license expires, at which time both plants will be decommissioned, the NRC said. A new generation of nuclear reactors is being considered in the United States as environmental concerns have intensified about coal-fired power plants.